grotesqueries, such as the aliens in Spacehawk. He went on to create outrageous faces for the covers of EC Comics' Mad and, many years later, DC's Plop, as well as a host of minor but ongoing characters such as Inspector Hector the Crime Detector, Salesman Sid the High Pressure Kid, and Mystic Moot & His Magic Snoot. But of all his many comic book creations, Wolverton's personal favorite was Powerhouse Pepper. Powerhouse Pepper first appeared in Marvel's Joker Comics (no relation) #1 (April, 1942), the title that later introduced Harvey Kurtzman's well-remembered "Hey, Look!" series, and the less-remembered Tessie the Typist (first of Marvel's woman-on-the-job line, which eventually came to include Sherry the Showgirl, Millie the Model and more). He's been described as a superhero parody just like Wolverton's earlier Stuporman, but his antecedants go back farther than Superman. The comics character he's most frequently compared to is Popeye the Sailor. Like Popeye, Powerhouse is an amazingly tough guy, and yet his ability to win any fight never goes to his head. He's kind, generous, and uninterested in worldly goods to the point where he once dug up an entire beach looking for a clam, and completely ignored the millions in buried treasure unearthed in the process. 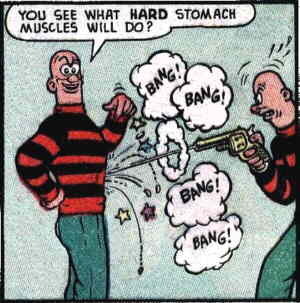 He's also, like Popeye, designed as only marginally human compared with other characters around him, with Popeye's bulging forearms and horizontal chin parallelled in Powerhouse's bullet-headed necklessness. A major departure from the Popeye mold was Wolverton's constant word play. Powerhouse Pepper sailed through life in a sea of rhymes, rhythms and alliterations, often — usually, in fact — carried to ridiculous extremes. Powerhouse Pepper appeared in every issue of Joker Comics (except the 28th) until #31 (undated, but it came out in 1947). He was seldom on the cover except in a small inset, but did have his own comic for five issues, the first in 1943 and the other four in '48. He frequently turned up in the back pages of Gay Comics, Rusty (no relation) and other humor titles Marvel published in the late 1940s. His last appearance in a comic book was Powerhouse Pepper #5 (November, 1948). In the early 1950s, he made several appearances in a pocket-sized cartoon and joke magazine that echoed the title of his first venue, Joker. Altogether, Wolverton wrote and drew more than 60 stories about him. Unlike most comic book characters of the time, Powerhouse Pepper wasn't forgotten. As recently as 2001, Fantagraphics Books, which has also reprinted such diverse comics as Prince Valiant, Little Orphan Annie and Zippy the Pinhead, brought out a book featuring 11 of his stories and a smattering of other Wolverton work. He may not have the name recognition of Batman or Blondie, but those who do know Powerhouse Pepper regard him as a classic. Text ©2005-09 Donald D. Markstein. Art © Basil Wolverton estate.